I’ve mentioned before how great I think the Swedish philosophy of having children enjoy the great outdoors daily no matter what the weather is. We don’t have the best climate here, so if kids only played outside when the weather was ideal for it, they wouldn’t be outside much. Instead, we have a saying that “there is no such thing as bad weather, just bad clothes”. 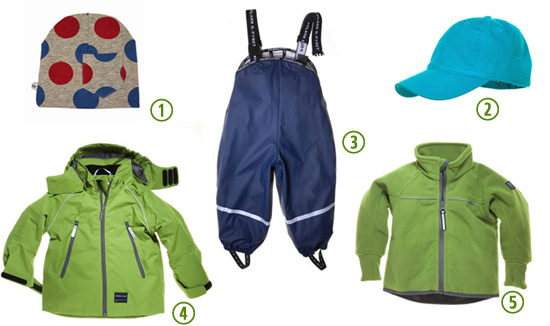 And when it comes to functional outdoor clothes for kids, I would venture to say that we probably have the best stuff you can get. I have raved about Polarn O. Pyret (PO.P) more times than I can remember (see for example here, here, here and here) and here comes another one. We get all of our functional stuff at PO.P. It feels expensive, but the quality is so so so good. You can definitely count on using this stuff long and hard, using it for siblings to come and then passing it over to cousins and friends after that. A light hat from Ebbe (not PO.P). It’s so cute with it’s little pocket and it is just enough to keep that little head warm on a chilly summer day. A cap from PO.P. It doesn’t have SPF like most of Alec’s other hats, but somehow it’s just the perfect shape, it stays on, and it really keeps the sun out of his face. 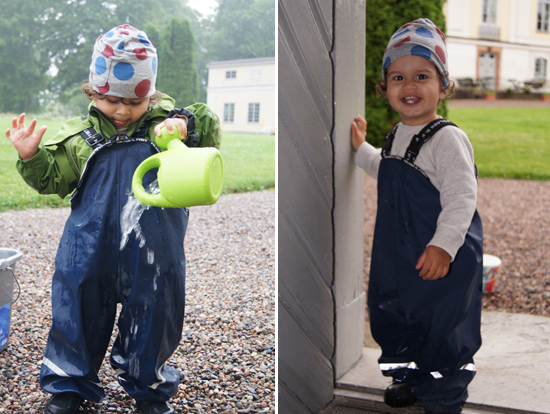 We also use several more waterproof and/or sun-protective hats from PO.P. Rain pants. These are fabulous. You just pull them on over shoes/boots and everything else and they keep your child completely dry no matter how wet it is. They are super durable – Alec is practicing stair-climbing over the stone front steps a hundred times a day and there is no sign of wear. They’re roomy and size-adjustable so we expect to get a lot of use out of them (even though we’ll need a second pair to leave at nursery school in the fall). And they are the cutest things ever on. We love them. Rain boots. We have these cute ones from PO.P. They look almost exactly like my Viking rain boots, which I think is pretty cute. Shell jacket. Alec’s been wearing this jacket since last autumn – some days with just a sweatshirt or long-sleeved t-shirt underneath, some days with his wind fleece instead of a winter jacket. Wind Fleece. This attaches to the shell jacket so we use them together a lot. But it’s also a great little fleece on it’s own. Crazy cute! OMG how CUTE is he?! miss him! !